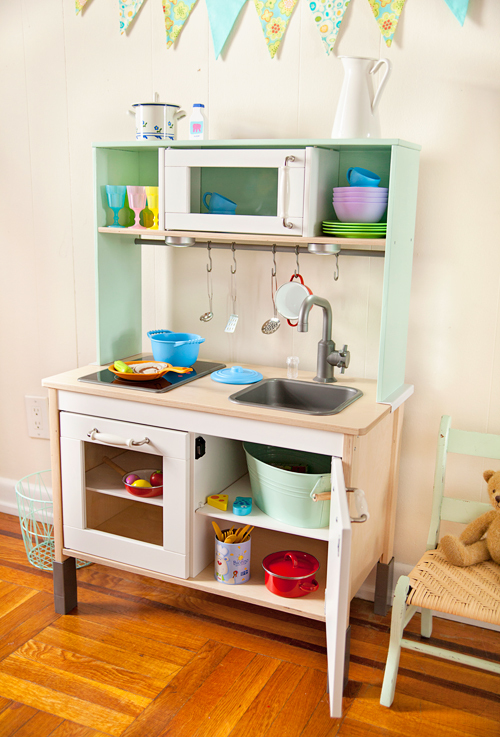 After some deliberation, I settled on the Ikea DUKTIG playkitchen for my kids. 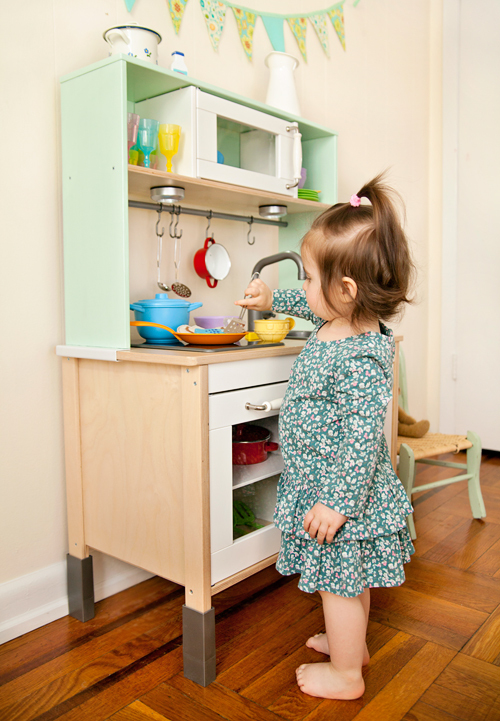 The simple, straightforward design appealed to me and this kitchen had all that my kids needed without being huge and overwhelming. We purchase the kitchen at the IKEA Brooklyn store. My kids were on pins and needles to have it assembled, but when I started unpacking the parts, I found two cracks in the wood, much to our disappointment. Driving back to IKEA to exchange the defective parts was not an option for us. Instead, I called customer service and asked them to send replacement parts. They had me e-mail them pictures of the defects and told me that the parts will be sent out withing 5 days. It took over 2 weeks and many phone calls till the replacements arrived at our door! To be fair, I think IKEA generally has decent customer service, but it's a problem with the local Brooklyn IKEA where the replacement parts were shipped from. I guess huge stores in Brooklyn are not notorious for customer service. The good news is, I was able to assemble the kitchen myself, without any assistance, which is not really a testament to my assembling skills, but rather to how easy it was to put together. 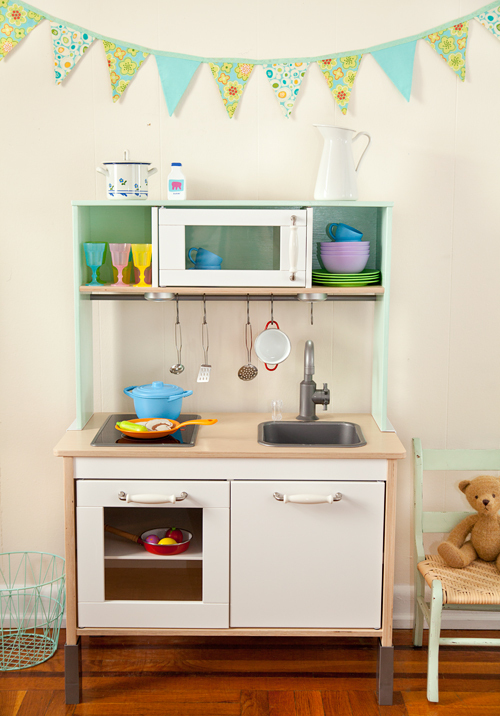 I also wanted to revamp the kitchen for Ben and Little Missy. Spray painting the kitchen would have been too easy, but because I'm a huge sucker for punishment, I decided to use chalk paint. I have a love-hate relationship with chalk paint. It dries way too fast, clumps up when you try to blend brush strokes and takes like 3 coats to achieve a solid color. So why did I choose chalk paint? Because it's 100% VOC-free and does not emit any chemical odor whatsoever. Since our weather was bellow 0, I couldn't use a regular primer and spray paint outside. The chalk paint can be used and left to dry right in my living room without any worries that I'm poisoning my kids. 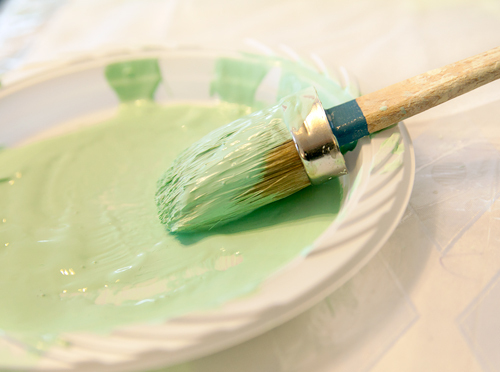 Also, on most surfaces, chalk paint does not require priming. Did I already mention what a pain it is to use? I know, blasphemy! There are die-hard chalk paint fans out there who are gasping right about now. I painted the upper planks before assembling the kitchen. It took me much longer than I bargained for because I had to apply 3 coats, sand in between, and then apply two layers of finishing coat to protect the paint. The sealer I used is called Clear Finish by Artisan Enhancements. It is all-natural, water based and quick drying. Anyhow, I had big plans for this kitchen, but as you can see, I got as far as painting just the top and then quit. 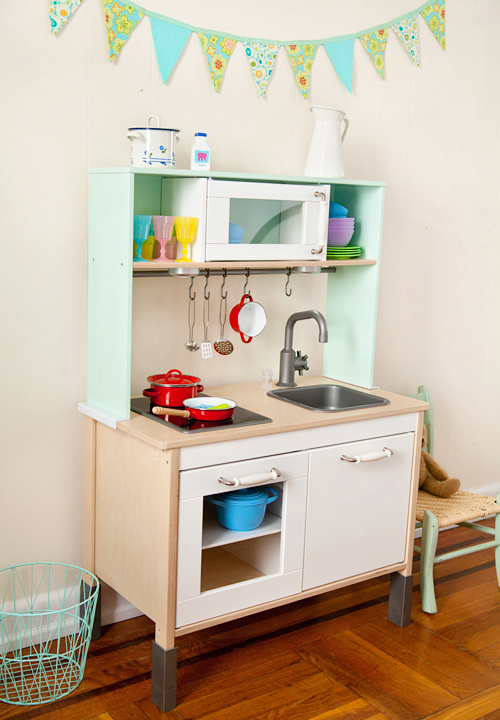 My kids were eager to put the kitchen to good use and I was getting pretty tired of messing with the chalk paint. My husband is probably gloating while reading this, since he was against the idea of painting the kitchen in the first place. After all, our kids would have enjoyed it just as much the way it was. But mommy is crazy and always needs to improve things. Another thing I did, was changed the ugly plastic cabinet handles to ceramic country-style handles from IKEA. Finally, I added two stick-on battery LED light fixtures under the shelf. Originally I planned on putting in a backwall with decorative paper, but since I couldn't find anywhere the paper that I had my heart set upon, I just gave up on the idea for the time being. Ultimately, while the kitchen did not come out exactly how I envisioned it (mostly because I didn't see my vision through), I think it's pretty cute. 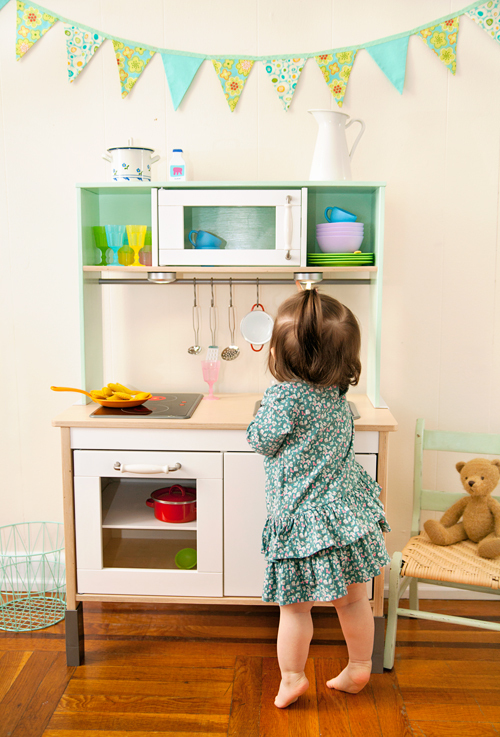 My kids are too young to know or appreciate anything in regards to decor and aesthetics, and would have been just as happy with the kitchen as it came right out of the box. 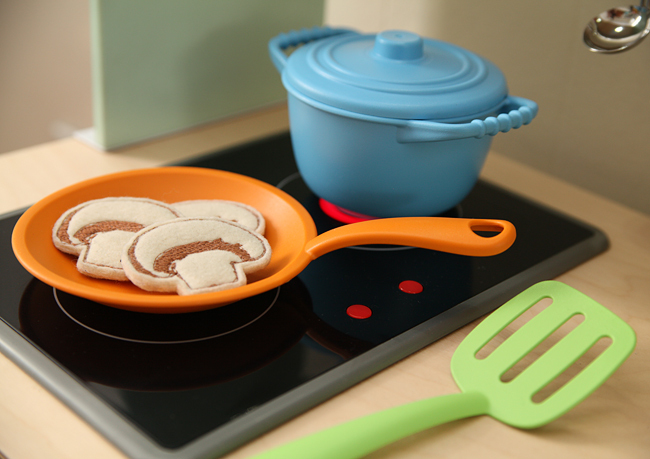 Cheff Set by Green Toys - The set includes a pot with lid, frying pan, spatula and ladle. I really like that the pot and frying pan are larger than most play cookware. Ben, the master chef, manages to fit quite a lot of ingredients into the 'stew' he cooks in this pot. Just like all other Green Toys, these are made in USA out of recycled milk jugs. 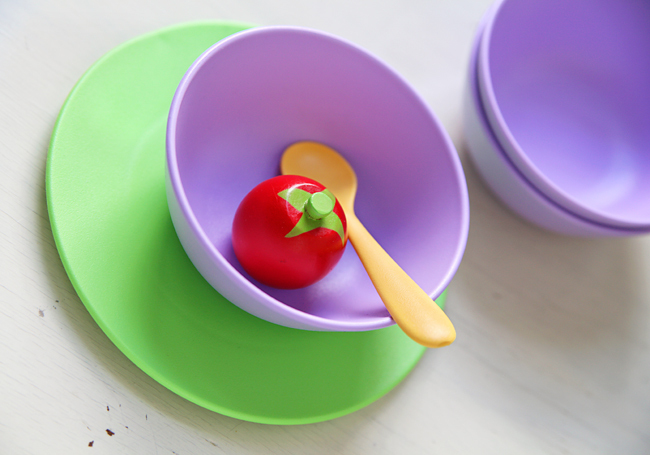 The Cheff Set is BPA and phthalates free, food-grade and dishwasher safe. The plastic is thick and feels durable. This set was on sale on Amazon for like $7, which I think is a pretty good bargain. I also ordered a stainless steel KidKraft Deluxe Cookware set. I'm holding off giving this one to my kids till they're a little older and will want more realistic pots and pans. The red enameled cookware set, I found in a local discount store. Here is the same one listed on eBay. The white enameled pot with blue flowers (top shelf) is from Nova Naturals. It's very pretty, but probably better suited for ages 4+, since it's somewhat delicate. Since we loved the Cheff Set so much, I also ordered the Green Toys Dish Set. Just like the cookware, the plates and bowls are much larger than most play dishes I've seen, which allows for more creative food combos. 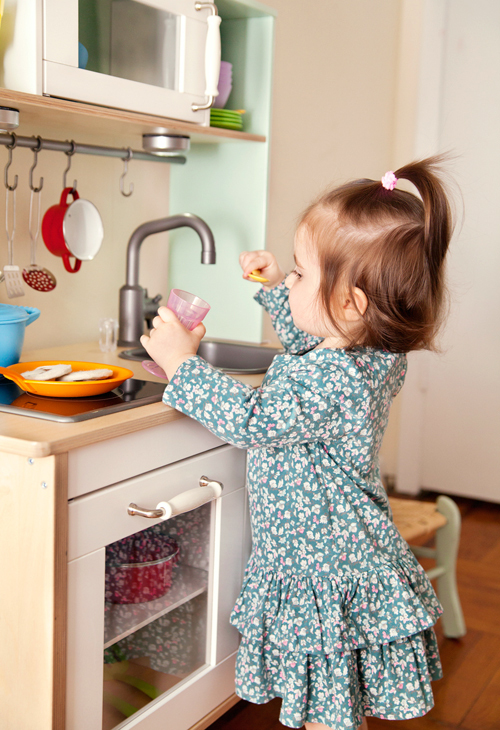 Once again, these dishes are BPA-free, food-safe and can be cleaned in a dishwasher. 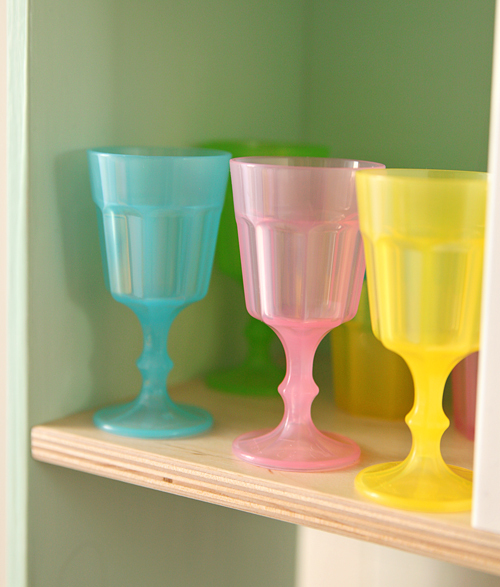 The colorful goblets and cups are also from IKEA, only $3.99 for an 8-pack! I'm being very selective with the play food, trying to strike just the right balance between having enough of food items to spark my kids' imagination while avoiding having too much, so that my kids will appreciate each item. I wanted them to have high quality play-food in a variety of textures and took my time selecting each food set. 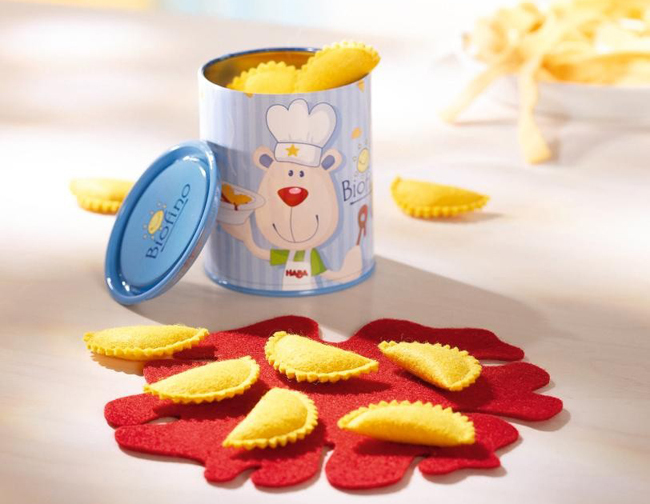 HABA Biofino Ravioli Tin - This is a set of ravioli made of felt. It comes in a storage tin with lid. Since there's a lot of ravioli and it's relatively small, this is a great play food item for kids to practice mixing. Felt Mushroom Slices - These are absolutely beautiful and were hand made by RootsClothWorks, a seller on Etsy. 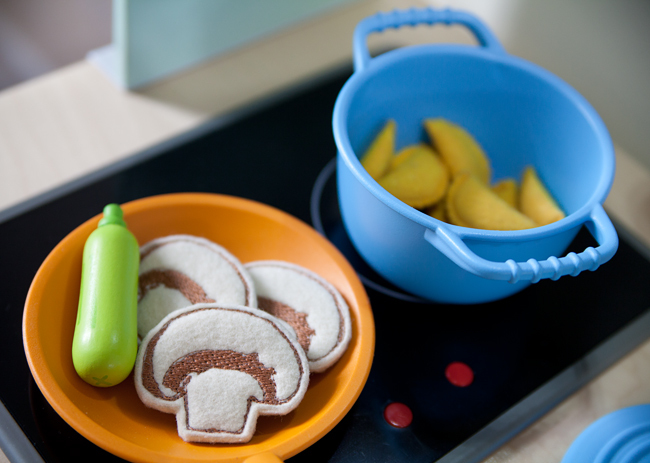 Since my kids love real mushrooms, they really enjoy having a play version to cook with in their kitchen. 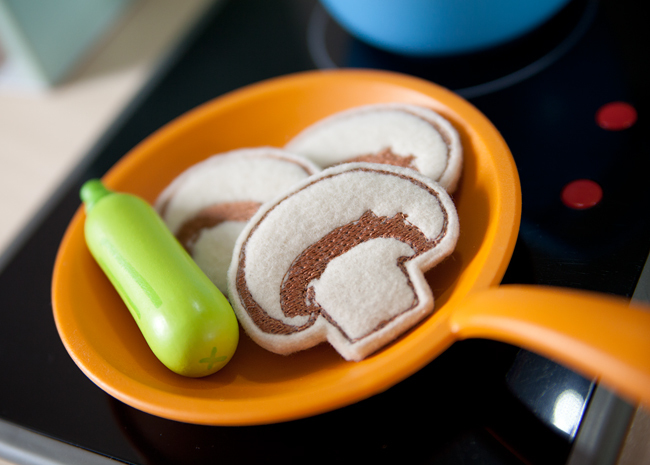 Over time, I would love to invest into some more artisan-made felt food. There are so many super cute options on Etsy, it's really hard to choose! I also found a wooden set of petite food staples in a Home Goods store. Can't remember the brand, but here's a similar wooden set by Plan Toys. Soon, I'm hoping to add a baking set to my kids' kitchen and trying to decide between the Melissa & Doug Slice and Bake Cookie Set and Sophia's Wooden Cupcake Set. As much as we tend to focus on the external characteristics of toys, let's not loose sight of the end goal. Through play, kids develop cognitive skills, polish their imagination and learn to mimic adult behavior. Watching Ben and Little Missy make decisions as to what to "cook" for supper, what ingredients should go together in a pot and how to best set up their little table for a meal, reassures me that the play kitchen is providing them with the right setting to practice their domestic skills. Just today, Ben got it in his head that he needs to clean his kitchen, because he saw me cleaning the real kitchen. He took all the accessories out, asked me for a wet rag, and proceeded to wipe down every surface of his play kitchen. I do hope this means he will tackle household messes once he's older, without any reservations. A mom can dream :-).